Last week I was in London and had the pleasure of catching up with Ian Rodwell from Linklaters, one of the largest law firms in the world and part of the magic circle of elite legal companies headquartered in the British capital. Ian has been a long-term advocate of our work and we spent an enjoyable 90 minutes talking about how lawyers can employ business storytelling methods in their work. We quickly set aside the obvious use of storytelling in the courtroom partly because it only represents a small proportion of legal work – that which is done in front of a judge. Then, after exploring the role of stories in pitching for work, building engagement among people in the firm, helping with change and communicating strategy, we dug into what is a daily necessity for many lawyers: quickly building a rapport with prospective clients. 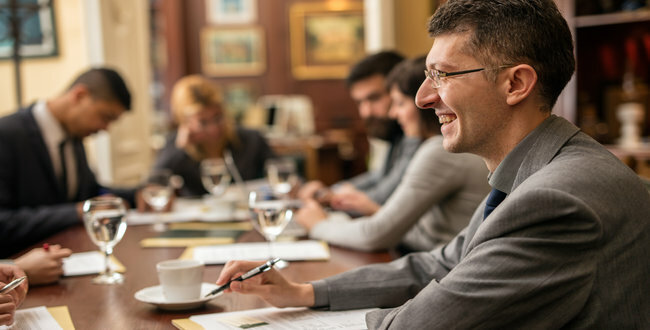 Like any good professional service provider, it’s vital that a lawyer makes a good connection with a potential client in the first meeting. Clients will only engage the services of a law firm if they feel comfortable with the professionals who work there. That means trusting each person’s capability to do the work, and also trusting them to do the right thing. Stories help clients make a quick assessment of both capability and character. In our Storytelling for Sales program, we teach people how to find and share connection stories to establish a rapport, fast. The two basic characteristics of a good connection story are that it gives people an insight into why you care about their business (you can’t make this up – you must find a real connection) and it illustrates how you are similar to the client, at least in some small way. Let me explain why and how you can do this. People don’t really listen until you show you care. If you just say you care, then that sounds like empty words. So someone in the building industry will pay little attention if you say, ‘Construction is so important for our economy and your business plays a significant role …’ It’s the equivalent of ‘Blah, blah, blah’. But what if you had an experience that illustrated to you the important role of that industry? Perhaps you witnessed some redevelopment, even played a part in it, and you now appreciate the role of innovative construction. If that’s true, then tell the story of what happened: ‘Innovative construction can have such an impact. A couple of years ago we helped Acme Constructions up in Liverpool …’ A good connection story will have your client thinking, ‘These guys really care about our business’. The second part of the connection story is about finding something you have in common with the person and sharing an experience relating to it. You might discover that they love woodworking after noticing a small parquetry inlaid table which they happen to have made. Now you might not have made anything out of wood in your life, but you might have seen another beautiful example of the craft. You should tell that small story. This might sound like a waste of time, just small talk, but nothing could be further from the truth. People like other people who are just like them, and they buy from people they like. While it’s true that Western cultures like the United States, the Netherlands, Germany and Australia like to get down to business fast, it still pays to spend some time building the relationship. At the other end of the spectrum are cultures that demand relationship building before any business happens, such as China, India, Mexico and Japan. In these cases, be prepared to tell good stories for half your meeting and while socialising afterwards. Ian Rodwell and I concluded that lawyers employ good business storytelling methods, just like many other businesses, to build relationships in order to win and retain work, and to build engagement among their people to keep everyone motivated, focused and performing well. Whether it’s to do with sales or leadership, story skills have become a vital capability.